Former Pasadena Poly standout pitcher Rob Rasmussen, who also helped UCLA to the College World Series in 2010, is coming home. He was traded by the Houston Astros to the Dodgers for Triple-A pitcher John Ely on Wednesday. In three minor league seasons, Rasmussen is 21-20 with a 3.88 ERA. He split last season between Jupiter in the Florida League, a Single-A league, and Corpus Christi, of the Texas League, a Double-A league. Rasmussen was 4-7 with a 3.90 ERA for Jupiter. He was 4-4 with a 4.80 ERA for Corpus Christi. There has been no announcement where he will be assigned to by the Dodgers. Rob Rasmussen is coming home. The former Pasadena Poly and UCLA standout was acquired by the Dodgers in a trade with the Houston Astros on Wednesday. The Astros received right-handed pitcher John Ely. Rasmussen was driving from his home in Santa Monica to his parents’ home in Pasadena when Astros assistant general manager David Stearns called to deliver the news. Crim is now the Dodgers’ bullpen coach. Jude Oliva resigned as San Gabriel High School varsity football head coach on Monday after three seasons. He was 17-17 at the school. Oliva cited health, career and family reasons for his decision to step down. Oliva suffered from gout and kidney issues this season, which caused severe joint pain. He and his wife just welcomed a newborn daughter. Oliva was not a full-time teacher at San Gabriel and will look for more gainful employment while also not ruling out a return to the sideline. “I just had a brand new baby girl and that gave me perspective on some things,” Oliva said. “I’m looking for a teaching job and trying to get some things lined up for myself. Oliva, a 1998 graduate of San Gabriel, had his best season in 2011 when he led the Matadors to a 9-5 record, Almont League championship and an appearance in the Mid-Valley Division championship game. Following the season, Oliva was named Pasadena Star-News Coach of the Year. He was also chosen to coach the West team in last summer’s National Football Foundation and Hall of Fame’s annual all-star game. Oliva replaced former longtime Matadors head coach Keith Jones in 2009 after serving as an assistant coach on Jones’ staff for eight years. San Gabriel was unable to parlay its 2011 success into 2012. The Matadors went 3-7 and were on the bad end of several hard-luck losses. San Gabriel missed the postseason after narrow losses to league foes Schurr and Montebello came back to haunt. Flintridge Sacred Heart’s Hannah Armendariz controls the ball as South Pasadena’s Sloan Bergstresser approaches during Thursday night’s nonleague game at at South Pasadena. The Tologs won 4-1. 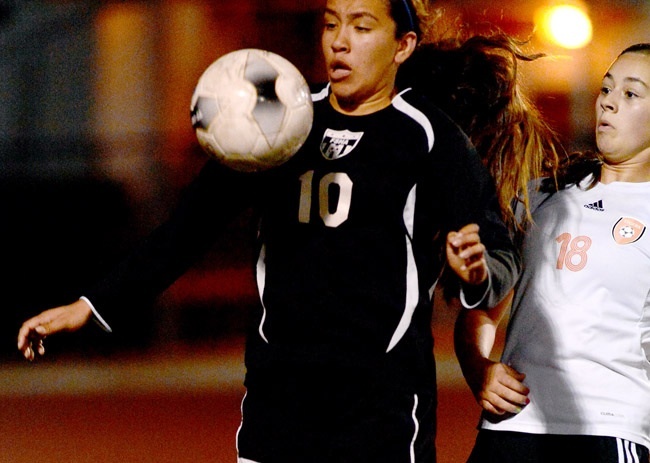 SOUTH PASADENA – South Pasadena High School girls soccer coach Randy Lilavois amped up the Tigers’ schedule in anticipation of a defense of its Rio Hondo League title and a hoped-for second consecutive long run into the postseason. But he will have to watch the outcome from afar. Lilavois, who led the Tigers to the CIF-Southern Section Division 6 semifinals last year and coached the Pasadena City College women’s program to its first state playoff appearance in seven years last month, is leaving the South Pasadena program to take over at Grissom High in Huntsville, Ala. He will remain the PCC coach. “It’s really hard for me to leave, but family is more important,” he said. Lilavois’ move is strictly family-related; for his family to be near other family members. The Grissom season is not until next spring. His body might be 2,000 miles away, but Lilavois’ heart will be with a team he has coached for six years. La Canada’s Brandon Hempstead has been playing with a heavy heart, but you’d never know it judging by his recent performances. Hempstead’s father Todd passed away last Friday after losing his battle with cancer. That night, Hempstead, a sophomore sharpshooter, led the Spartans to a win in the semifinals of the Arroyo Tournament. The next night, the Spartans lost in the finals, but Hempstead was named to the all-tournament team. On Monday, Hempstead and his teammates buried his father, then went out that night and beat Besant Hill in the La Canada Tournament with Hempstead leading the way with 29 points. “It was totally up to him,” La Canada coach Tom Hofman said about Hempstead’s desire to play. “I think for him, it was a good release to distract him from everything that’s going on. And his dad was a huge basketball fan and loved watching him play. Wednesday’s loss by the Spartans to Hart has La Canada likely playing in Saturday’s third-place game at 6 p.m. against the loser of Friday’s game between St. Francis and Bonita. There is a small chance the Spartans could be in the championship game, but that would require an Arcadia upset of Hart on Friday night. Here’s some video highlights from last night’s game. MONROVIA – There may be a time when Monrovia High School will look back at the 2012 football season and have good thoughts about arguably the best year in the program’s history. Instead, the Wildcats can only reflect on what might have been. Lee Walker returned a kickoff 91 yards for the go-ahead score late in the fourth quarter, Jamie Gomez scored two touchdowns and had two interceptions and Madison of San Diego ended Monrovia’s hope for a CIF State championship with a 21-17 victory over the host Wildcats on Saturday in the CIF State South Region Division III Bowl. Madison improved to 13-1 and will face Marin Catholic for the Division III state championship next Saturday at noon at Home Depot Center. Monrovia, getting 194 yards passing and a touchdown from Blake Heyworth and 118 yards rushing from Darione Jones, finished 12-3. The Wildcats won their third consecutive Southern Section Mid-Valley Division title a week earlier. It looked like they would have a shot to add a state championship to their resume after Heyworth threw 16 yards to Anthony Craft for a 17-14 lead with 5:44 left. But it was wiped out in a blink of an eye. Walker went up the middlefor 91 yards on the ensuing kickoff to put Madison ahead at 21-17 with 5:29 left. Monrovia, which had two scoring chances end with missed field goals in the first half, had two chances in the final five minutes. But the Wildcats gave the ball back on downs at the Madison 44 on an incomplete pass and Michael Garner intercepted Heyworth on a long pass inside the Warhawks’ 20 with 10 seconds left. Gomez gave Madison a 14-7 lead early in the third quarter with a 25-yard interception return. Mason Bryant countered with a 28-yard field with 3:39 left in the quarter. Monrovia also had a shot to take the lead, but Gomez intercepted Heyworth in the end zone on a third-and-goal pass at the 8 early in the fourth quarter. The first half was as tight as anticipated, with each team taking its shot. Monrovia, which had been averaging close to 300 yards rushing in the playoffs, had 132 during the first two quarters, including 44 in an 80-yard drive on their third possession that gave the Wildcats a 7-0 lead. Heyworth had completions of 18 and 24 yards before Bryant and Craft followed with runs of 10 and 11 yards to get Monrovia inside the Warhawks 10. Ainsworth, who had 61 yards in the first half, then took it in from the 7 with 4:52 left in the quarter. Madison, which had 109 total yards in the first half, took advantage of Monrovia fumble to tie it early in the second half. The Warhawks, after getting the ball following a fumble by Darione Jones at the Monrovia 27, needed just six plays to get even and tied it at 7 on a 3-yard run by Gomez with 10:42 left in the first half. Monrovia had two chances to reclaim the lead. But Bryant’s 26-yard field goal try hit the upright with 3:20 left in the half, and a 54-yard attempt with six seconds left was short.